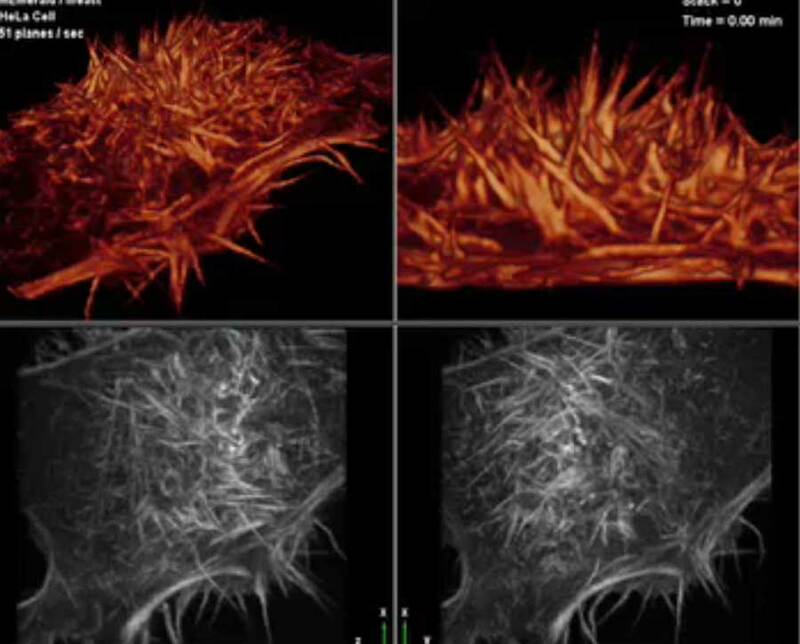 A new microscope creates spectacularly detailed movies of living cells. Slideshow: One of the dirty secrets of biology is that most of the cells we study are dying. The laser light scientists use to take gorgeous images of cells causes fatal damage, in addition to quickly bleaching out the fluorescent proteins that appear in the image. Now scientists at the Howard Hughes Medical Institute’s Janelia Farm, in Ashburn, Virginia, have built a microscope that can take 3-D movies of living cells that are not only highly detailed and fast but also nontoxic. By shining a thin sheet of light through a sample, Eric Betzig and colleagues greatly reduced a cell’s exposure to toxic laser light. By pulsing the light on and off rapidly, they were able to get a set of overlapping images from which a computer program could subtract fuzziness. For speed, they could switch to another mode that allowed them to take nearly 200 images per second. The thin laser beam they used, called a Bessel beam, allowed them to boost their resolution. The membrane of this cell has formed petals that ripple and ruffle across its surface, causing Betzig and his collaborators to nickname the image “The Rose.” Here they used the mode that allowed them to take 200 shots per second, capturing every movement of the delicate structures. 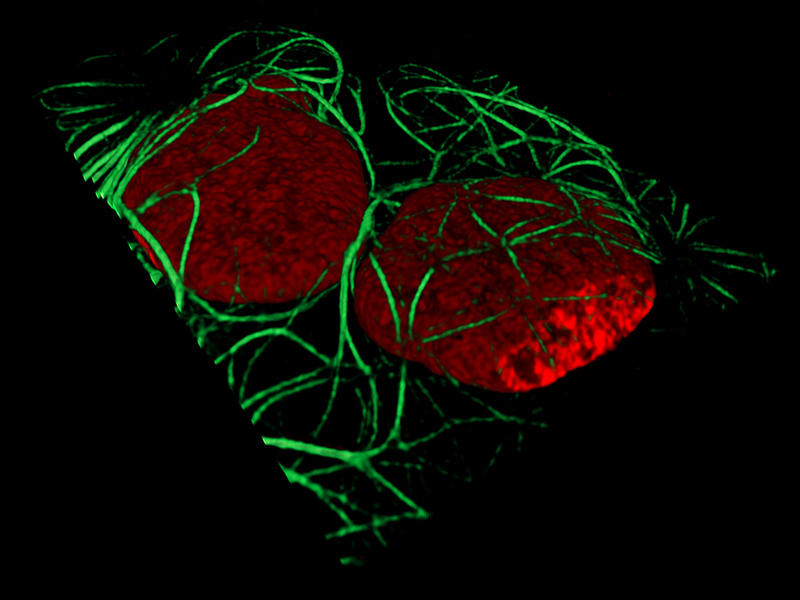 Slideshow: Pressed between a microscope slide and a cover slip, the nuclei of two cells glow red in this image; green microtubules—the girders of the cell—wind around them. Here the researchers used the mode that allows them to subtract fuzziness, resulting in a spectacularly clear and detailed image. 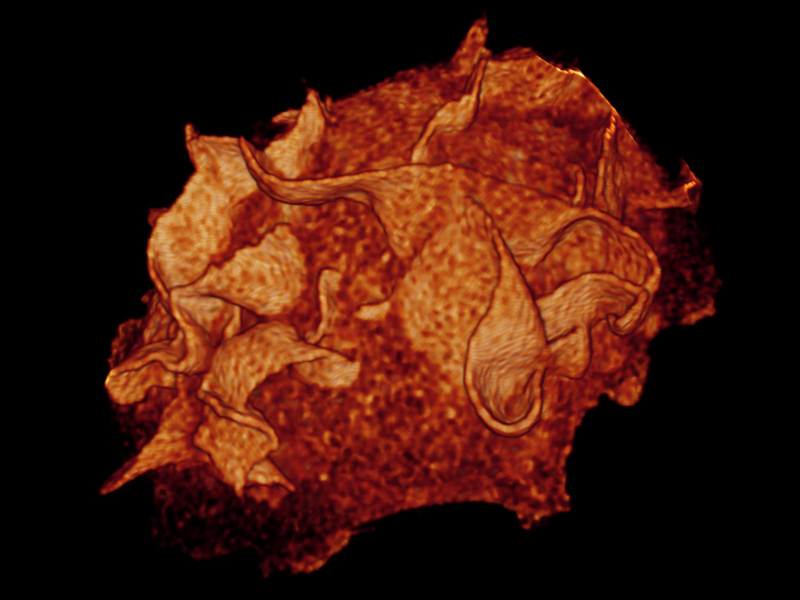 Mitochondria that endure 300 3-D images with a traditional confocal scope fall apart. 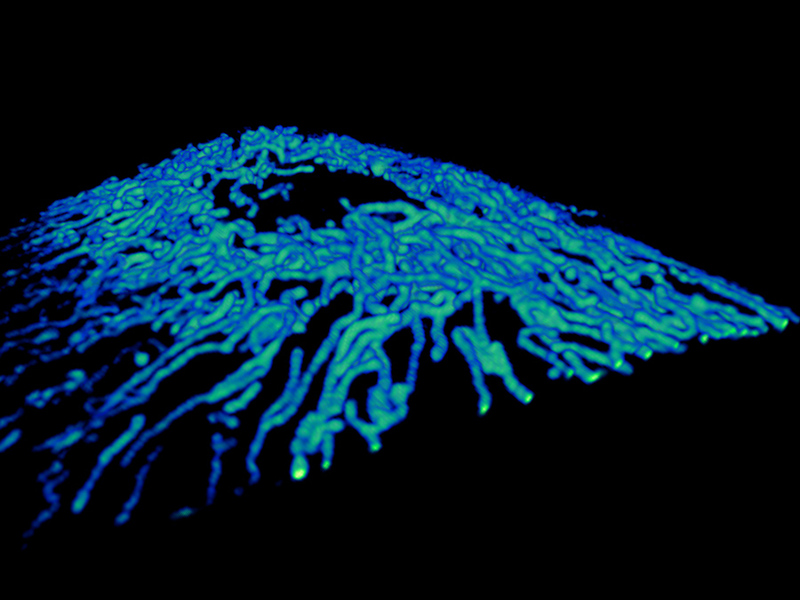 But after a similar number of shots with the new microscope, the mitochondria were still healthy, as this picture shows. 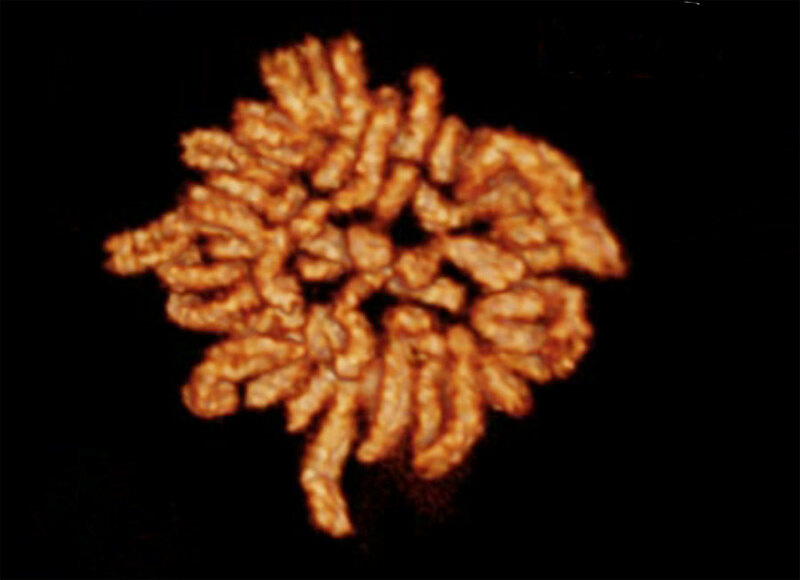 A network of glowing mitochondria surround the cell’s untagged nucleus (represented by the empty cavity at the center). 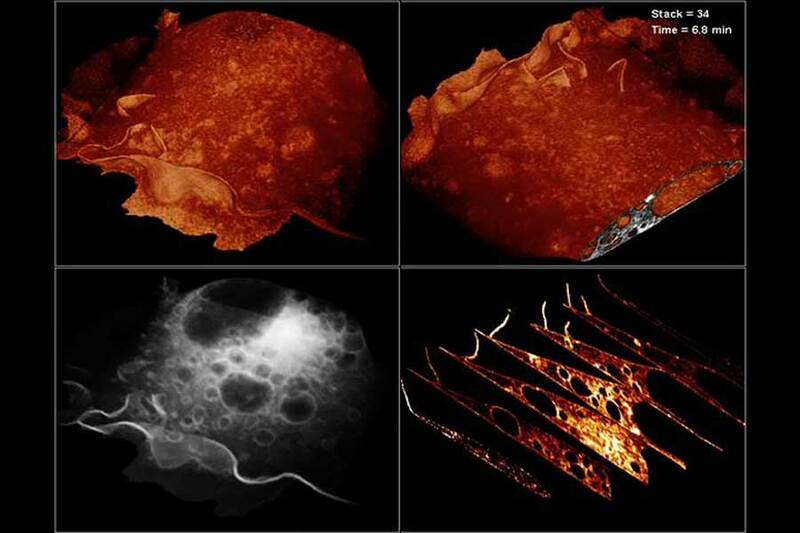 Slideshow: The two upper panels of this video (still image above) show different views of a cell while the lower left shows the presence of bubbles, called vesicles, within it. On the lower right, the thin petals can be see in cross-section as they form, ripple over the cell, and subside. Built from 40,000 images, this video provides scientists with an unprecedented amount of visual information. Slideshow: Chromosomes in a cell line up next to each other and then slide apart as they are partitioned into two daughter cells (watch video). With traditional forms of microscopy, the resolution is not high enough to allow 3-D images of chromosomes, so this process can only be recorded in two dimensions. “It’s like trying to take a slice through your car engine and figure out how the car engine works from just that slice,” says Betzig.